Nora just got the sweetest little package in the mail! Kristin, A sorority sister of mine just started her own business and she sent Nora the most adorable little pair of flip flops! They are so stinkin cute and very well made. Check out The Little Dragonfly! Thanks Kristin!!! We love them! SOLD! Sorry girls! Now I know what to do next time I want to sell something! A blog is way better than Craigs List!!! We've been doing some furniture rearranging. One of the big bookshelves from my office just made its way to Nora's room so we are retiring the doll house bookshelf. We love it but just can't find a spot for it. I'm going to post it on Craig's List later today but thought I might throw its picture up here and see if any one is interested. Want it? Email me...we'll make a deal! NEW! 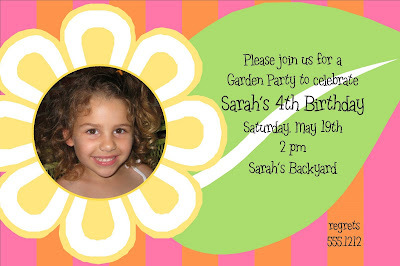 Garden Party invitation...with or without photo...turns out so cute! I can't begin to describe how much we all loved Disneyland! We've always wanted to take our kids to Disney (Land or World...we didn't care, we just wanted to see one of them) but we didn't think it was going to happen anytime soon. We were so excited when Nathan found out he had a company meeting in Carlsbad, CA! Our immediate thought was Lego Land...Graham is CRAZY obsessed with Legos. We didn't even realize how close we were going to be to Disney until about two days before we left. Disneyland was a total last minute decision and we are so HAPPY that we went. I'd go back tomorrow if I could...I might not drive there but I'd be thrilled to go again! FABULOUS and MAGICAL!!!! LOVED IT!!! Charlie: "I will not be photographed without my Mickey ears!" Charlie saw kids with Mickey ears while we were walking towards the park. He immediately knew he NEEDED them. He was determined to find them right away! He wore them ALL DAY long! It was adorable. There's nothing like seeing a three year old at Disney. He was so into it. I thought the older two were going to love it and he was going to get tired and cranky. The older two did love it but he was by far the most enamored by it all. He never got cranky (once he got his ears) and he was so fascinated all day. Charlie was all about meeting the characters! Nora with her "least favorite" princess. Nora was very congenial to Jasmine despite the fact that she finds her "freaky." Belle is her favorite so we were so excited to see her!! We stumbled upon a meeting with Mickey after touring his house. The sign on the door said he was away so we were SO HAPPY to find him at the end of our tour. Unfortunately, it was a dark room and I was so surprised to see him that I didn't get a lot of great pictures. I love this one though! We were one of the first families there and we stayed until Tinkerbelle flew and the fireworks were over. We feel so blessed that we got to go...these will be some of my favorite memories for sure. I thought summer would be slow. I figured everyone would be too busy shuttling kids to camp and splashing in the pool to take time to order pretty paper. I was so very wrong! Orders are piling up (no complaints) and I just wanted to let you know that right now if you have an order in or are getting ready to place an order, please be prepared to wait the full 2 weeks. Thanks for being so patient with me and hopefully soon I will get back to a quicker turnaround. Happy Father's Day Nathan! You are the perfect daddy for our sometimes wild and crazy but most of the time sweet and fabulous children. You're pretty good lookin' too! Did I mention that we DROVE to Disneyland??? Oh yes we did! It was our first MAJOR road trip and I'm gonna say it was pretty successful. Not perfect, but not pure torture. We stocked up on stuff to keep them entertained...might I suggest the Crayola Glow Station for nighttime driving?? We left on a Tuesday afternoon and made our first stop about 10 hours later in Albuquerque. We woke up the next morning, hit the local Target and then headed to Tucson. Nathan's sister and her husband live there so it was fun to stop and stay with them. We had never seen their house or met their SWEET dog Ruby and the kids were super excited to see them. Their backyard is beautiful and they even got out the kiddie pool. Look at what a great big brother Graham is...he played in that tiny pool to make Charlie happy...so sweet. After leaving Tucson we headed to Carlsbad, CA. Thanks to The Baker's lovely company we got to stay at a beautiful resort. BEAUTIFUL. This is me trying to get all artistic on the cool steps near our room. This is a normal picture. This is The Baker. Cute. The next day we woke up bright and early and headed to Anaheim. We did a little reenactment of the Griswold's by being one of the first cars in the Disney parking lot. Seriously. How happy is this girl? Setting out to find Tinkerbelle...the REAL one! Look at this sweet BABY!!! I was honored to get to do these announcements for Baby Cash!!! They are my first double sided announcements and it was so fun to get to be just a tiny part of telling the world about this cute little guy! Candy Bars for Miss Kennedi's 2nd Birthday!